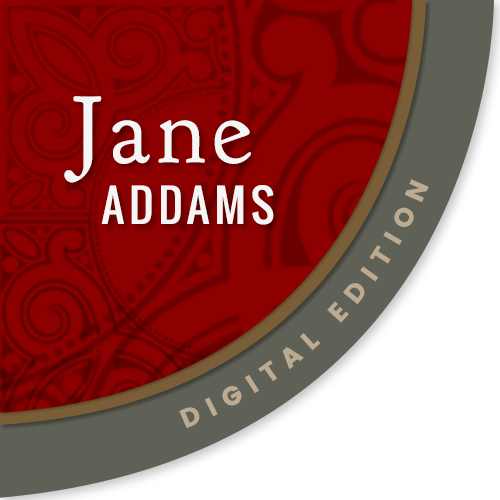 Subject is exactly "Addams, Jane, religious views"
Addams expounds upon the role of religious education in keeping youth from vice and examines the difficult standards to which young women are held. 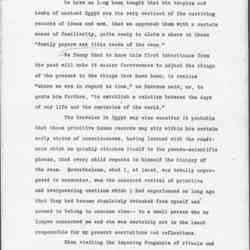 This is the third in a five-part series, which would ultimately be published as A New Conscience and an Ancient Evil later in the year. 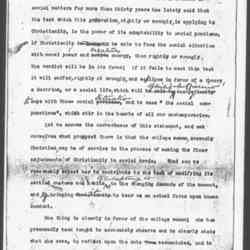 Addams argues that it is the responsibility of a democracy to care about the social needs of its citizens. 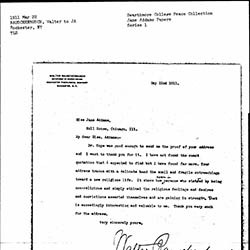 Smith writes Addams about a young man inspired by her work and asks her what role her Christian faith and religious beliefs inform that work. 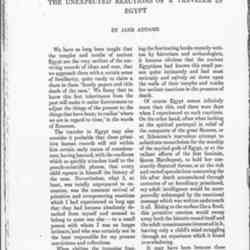 Sedgwick would like to publish Addams' essay on her travels in Egypt in the Atlantic Monthly. 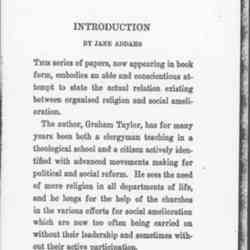 Addams introduces and summarizes the content of Graham Taylor's book, provides some biographical information on Taylor, and praises the work. 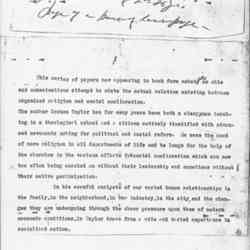 Hatfield offers Addams advice on dealing with claims that Hull-House is a bed of Anti-Catholic activism. 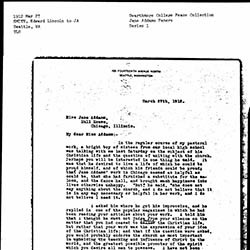 Addams seeks Hull's advice about joining the Neutral Conference for Continuous Mediation and remarks about her religious affiliation. Wethey praises Addams' two latest books and expresses much interest in her series in McClure's Magazine. 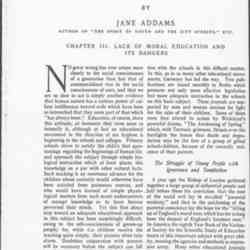 A draft of Addams' article about the challenges facing college women who want to contribute to society. Addams discusses the challenges facing college women who want to contribute to society. Addams introduces Graham Taylor's collection of essay, providing biographical information on Taylor, and praising his work. 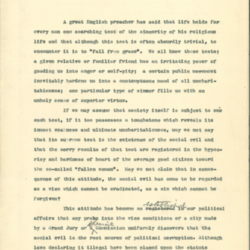 In this draft, Addams offers a strong indictment against old fashioned religious education and argues that the church, in order to encourage modern youth to see the validity of religion, must engage the realities and distractions of urban life. 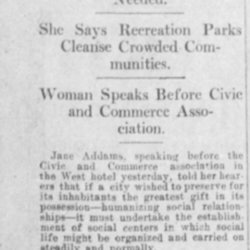 A newspaper report of Addams' speech before the Civic and Commerce Association in which she discusses the benefits of social centers. 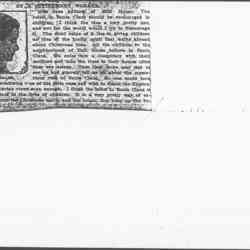 Addams extols the benefits of cultivating a belief in Santa Claus among children. 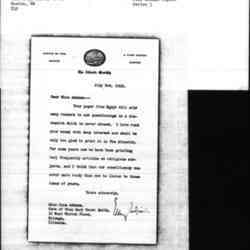 It was part of a larger article, "We Believe in Santa Claus," published in a variety of newspapers. 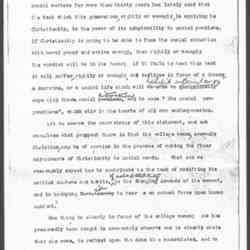 A reprint of Addams' speech to the Congress of Men and the Religion Forward Movement chastises the church for rejection aid to "fallen" women and asks for a return to the teachings of Jesus, who opened his heart to all sinners. 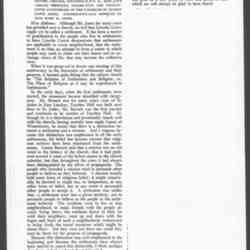 Addams' speech to the Congress of Men and the Religion Forward Movement chastises the church for rejection aid to "fallen" women and asks for a return to the teachings of Jesus, who opened his heart to all sinners. 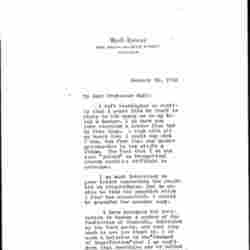 The speech was also published in Vigilance. 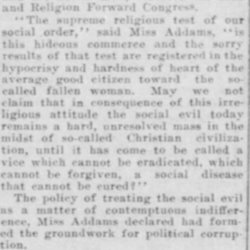 A newspaper report of Addams' speech in New York entitled "The Church and the Social Evil." 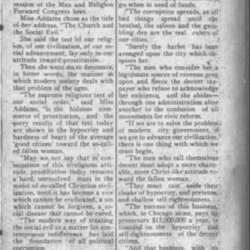 Addams' speech to the Congress of Men and the Religion Forward Movement chastises the church for rejecting aid to "fallen" women. She calls for a return to the teachings of Jesus, who opened his heart to all sinners. 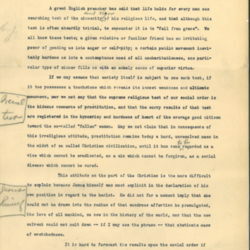 The speech was later published in Messages of the Men and Religion Movement and in Vigilance. 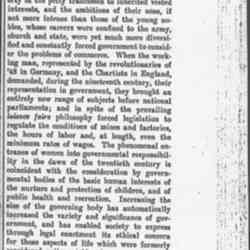 A newspaper report of Addams' speech in New York on "The Church and the Social Evil." 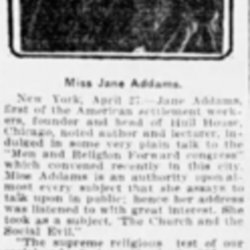 A newspaper report of Addams' April 23 speech at Carnegie Hall entitled "The Church and the Social Evil," published on May 13. 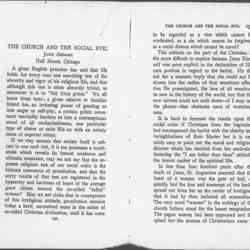 A published version of Addams' speech to the Congress of Men and the Religion Forward Movement chastises the church for rejection aid to "fallen" women and asks for a return to the teachings of Jesus, who opened his heart to all sinners. 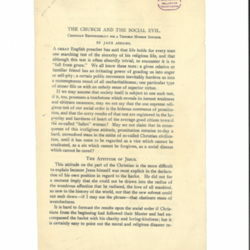 The speech was also published in Messages of the Men and Religion Movement. 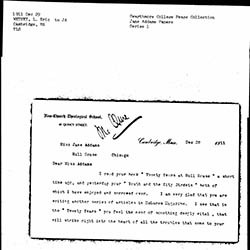 Addams discusses the challenges facing college women, including the habit of self-preparation, a tendency to make an exception of herself, and the danger that study without action makes a person timid and irresolute. 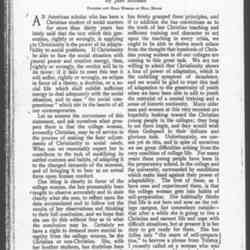 She argues that there is a need to do and to do for others without concern for one's own reputation that makes for good Christian work. Addams introduces a discussion about the purposed of social settlements at the Abraham Lincoln Centre. The event celebrated the twenty-fifth anniversary of Jenkin Lloyd Jones' pastorate. Addams exposes the double standard applied to women who break society's moral codes and argues for a more charitable view of women and a better understanding of their economic circumstances. 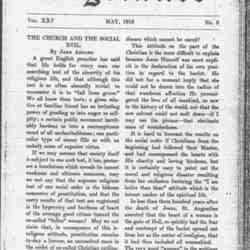 A version of this was published in November 1913. 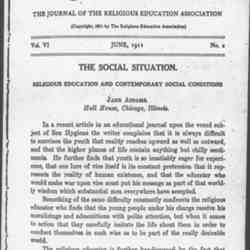 Addams offers a strong indictment against old fashioned religious education and argues that the church, in order to encourage modern youth to see the validity of religion, must engage the realities and distractions of urban life. 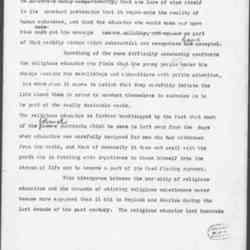 Addams, comparing past and present ideas of religion, discuses ideas on morality and the human condition. Addams, compares ideas of religion in the past and present and discusses ideas on morality and the human condition. 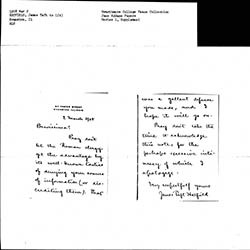 Rauschenbusch thanks Addams for sending one of her speeches to him as requested.